As a teenager myself in the eighties I loved this book. Helen MacKinven’s attention to detail and many 80s references brought back so many memories. I remember feeling very grown up reading Just Seventeen when I was all of 13! So many foods were mentioned too such as Findus Crispy Pancakes and Spicy NikNaks – such haute cuisine we had in the 80s! I loved all the dialect in the book too which added a real authenticity to the characters, as well as again evoking memories. I had almost forgotten the word ‘beamer’ for getting a red face which I don’t think my own children use and even just the simple abbreviation of ‘ the icey’ for an ice-cream van made me smile. And who except an 80s teen would know that Gripper Stebson was the Grange Hill bully? But enough of my reminiscences, onto the storyline. I thought this was an excellent portrayal of teenage friendship. All the angst, uncertainty, jealousy, trauma and worry of a typical teen was laid out in the friendship between Angela and Lorraine. They have been friends since Primary One and over the course of the book we see that friendship tested to breaking point. Angela is a character you will really empathise with. She is a talented artist and dreams of going to art school. But in her poor, working class area that just doesn’t happen and her parents want her to get a job as soon as possible. Only her Gran, Senga, believes in her and encourages her in her ambition. And what a brilliant character Senga is! She’s not really a Senga but changed her name from Agnes which she didn’t feel fitting for her status as a pet psychic. I would love to know Senga’s life story – I bet it would be hilarious! She is really down-to-earth, but caring and wise. Some darker aspects of 80s life are also exposed in the book and it was sobering to remember the casual racism, sexism and less than understanding attitudes to disability that prevailed. I don’t remember sectarianism being such an issue when I was younger but I think the further west in Scotland you go, the more prevalent it was. 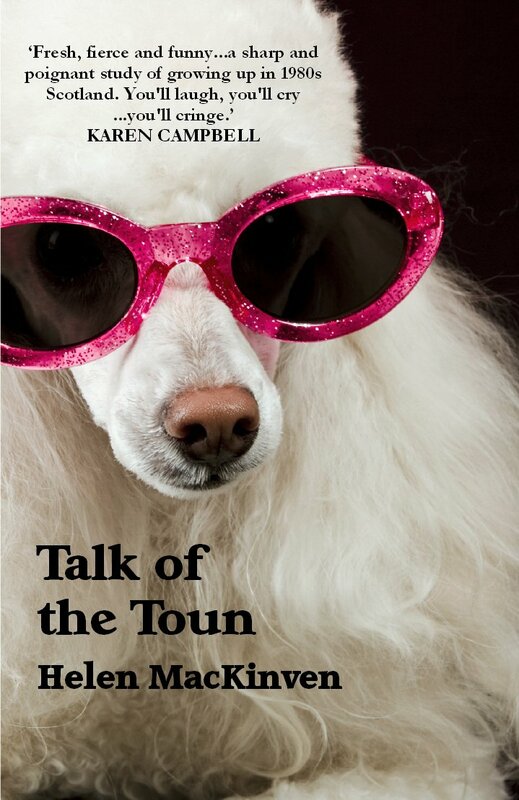 So if, like me, you were a child of the 80s and fancy a trip down memory lane that will make you smile, laugh and possibly cry a little, you should definitely get yourself a copy of The Talk of the Toun. By day my job involves working with numbers as I travel all over Scotland to deliver maths training for teachers. At night, I play with words writing short stories and working on my latest novel. After watching one too many episodes of Escape to the Country, I moved to a three hundred year old cottage in a small rural village in North Lanarkshire to live with my husband. I have two grown-up sons but I have filled my empty nest with eleven chickens, two dogs and two pygmy goats. My main hobby is reading which is essential to develop my own writing. I also enjoy city breaks, gardening and anything arty. I went on a Caribbean cruise with four colleagues in 2004 and we joked that we could all write a book considering the ups and downs we’d been through in our lives. It’s something many folk say as a throwaway remark but it gave me the idea to challenge myself to actually go ahead and write a book. The novel is called, ‘The Sunbirds’ after the name of the cruise ship and is about four very different women with very different reasons to get away who take a girls only cruise and embark on a journey of self-discovery that tests the dynamics of their friendships. It was what I’d describe as a ‘practice’ book and wasn’t well written but it made me keen to develop my writing skills. 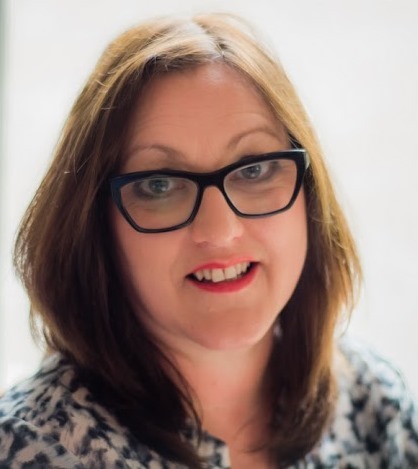 Knowing I needed to improve my writing, I did courses and workshops and wrote a second book which secured me a literary agent but not a publishing deal. Despite the rejections, I kept writing and decided to ignore all the advice not to give up your day job and took a career break to go to Stirling University to do an MLitt in Creative Writing. After graduation I finished a third book, my debut Talk of the Toun and I was offered a contract with ThunderPoint Publishing. My book is an uplifting black comedy of love, family life and friendship. It’s a bittersweet coming-of-age tale as two girls wrestle with the complications of growing up and exploring who they really are set against the religious and social landscape of 1980s Scotland. Progress might be a bit too strong, it’s more of an idea and a few thousand words but I’ve started a novel. It’s set in the Lanarkshire town of Airdrie after the referendum result but with a local historical event related to the Leningrad Siege weaved into the narrative. I’d like to get stuck into after Christmas and really explore the idea. So far this year I’ve read 38 books and there have been some belters within my diverse reading picks. Three favourites would be Pig Iron by Benjamin Myers, The Good Son by Paul McVeigh and Rise by Karen Campbell. The Spool of Blue Thread by Anne Tyler. I’ve heard so many great things about her writing but this is the first of hers I’ve read and I can now understand why she’s highly rated for creating interesting characters within family narratives. A friend gave me her old Kindle but I’ve yet to use it as I prefer a ‘tree’ book and like hardbacks better than paperbacks. I usually read in bed before I go to sleep or on the lounger in my garden on the rare Scottish day when it’s sunny (I save magazines for reading in the bath). It would be Carrie Bradshaw from The Carrie Diaries by Candace Bushnell as she portrays a fantasy life of a writer which is a million miles from my own. She gets to wear designer clothes and shoes, goes to fancy restaurants and bars and always has a witty one-liner ready to entertain her friends. “She was greetin’ again. But there’s no need for Lorraine to be feart, since the first day of primary school, Angela has always been there to mop up her tears and snotters.” An uplifting black comedy of love, family life and friendship, Talk of the Toun is a bittersweet coming-of-age tale set in the summer of 1985, in working class, central belt Scotland. Lifelong friends Angela and Lorraine are two very different girls, with a growing divide in their aspirations and ambitions putting their friendship under increasing strain. Artistically gifted Angela has her sights set on art school, but lassies like Angela, from a small town council scheme, are expected to settle for a nice wee secretarial job at the local factory. Her only ally is her gallus gran, Senga, the pet psychic, who firmly believes that her granddaughter can be whatever she wants. Though Lorraine’s ambitions are focused closer to home Angela has plans for her too, and a caravan holiday to Filey with Angela’s family tests the dynamics of their relationship and has lifelong consequences for them both. Effortlessly capturing the religious and social intricacies of 1980s Scotland, Talk of the Toun is the perfect mix of pathos and humour as the two girls wrestle with the complications of growing up and exploring who they really are. Great review Joanne. This one’s on the wishlist. I do love a wee trip down memory lane! It brought back so many memories – highly recommend it. Oh please do – would be brilliant! Fab post, ladies! Made me think of so many of my own 80s memories (my massively big hair being one of them!) 🙂 Great review, Joanne. Good to learn more about Helen and her writing journey, etc.